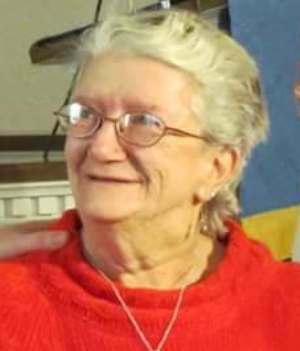 Linda L. Faraday, 70, of Fremont, OH passed away at her home on Saturday, August 4, 2018. She was born November 16, 1947 in Altoona, PA, the daughter of James and Beryl (Douglas) Houck. She was a 1968 graduate of Williamsburg High School. Linda married Murry J. Faraday on June 16, 1991 in Cleveland, OH and he preceded her in death on June 13, 2018. She worked as a nurse’s aide for twenty-one years. Linda was a member of Trinity United Methodist Church and the Red Hats Society. She loved making crafts, listening to music, baking and spending time with family and friends. Linda is survived by her daughter, Michele Mathew, Fremont, OH; son, Allen (Nicole) Jordan of Thailand; siblings, Lester Houck, William Houck of Williamsburg, PA, Sandra Horn, Meadville, PA and Deborah Holsinger, Bradenton, FL; grandchildren, Ashleigh and Amberleigh Mathew, Naomi Jordan; great grandchildren, Kayleigh, Hunter and Alex and adopted family. She was preceded in death by her parents, husband, Murry Faraday; brother, Chester. A Memorial Service will be held on Friday, August 10, 2018, 11:00 am, at Trinity United Methodist Church, 204 North Wayne St, Fremont, with Pastor Ben Wallick officiating. Memorials can be made to Trinity United Methodist Church or to the family. May God bless Linda and keep her always. I’ve known Linda for over 40yrs she and her daughter Michele were a huge part of my childhood Linda was always kind to me, she was so intelligent, fun and I will never forget her. I pray that her family and friends find comfort in the Lord for he promises us many dwellings in his kingdom.